VIDJA is a video game magazine that explores not only gaming, but how it relates to culture as a whole. Our readers love games: how they are designed, how they play, how they tell stories, and how they impact us. In addition to exploring up and coming games, and providing honest reviews on consoles and games, VIDJA is dedicated to continuing conversations about gender, race, economics, education and other societal issues through the lens of video games. Video Gaming is a growing market in media and entertainment that has become a part of our culture, yet there is a lack of content that celebrates inclusivity and showcases critical thoughts on gaming culture as a whole. 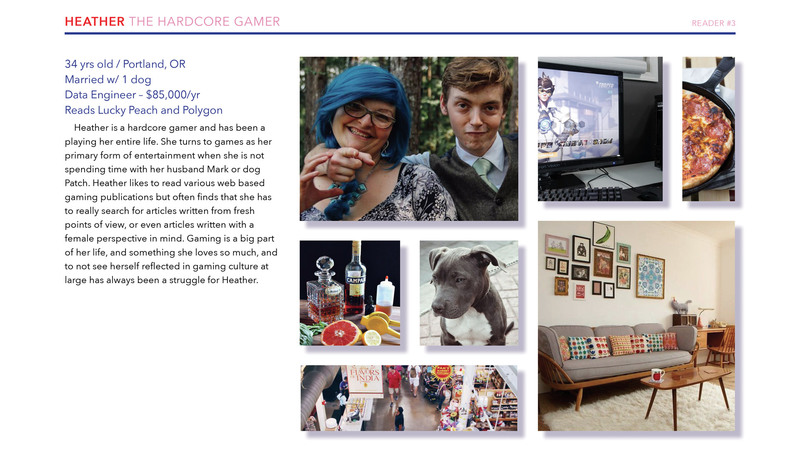 Create a visually striking print and web magazine and that explores showcases various points of view on gaming culture that is honest, inclusive, tenacious, and totally geeky. 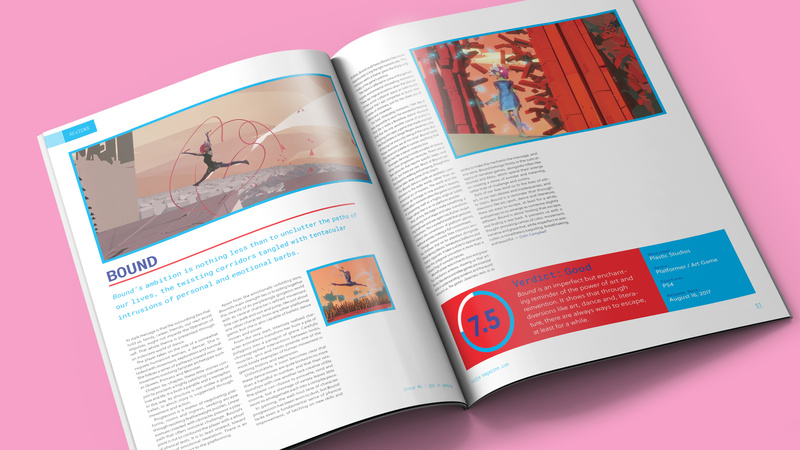 A printed video game magazine that features articles written by a diverse group of writers featuring bold and celebratory visuals to add additional value to print work for a subject that lives in a mostly digital space. I conducted research to better understand my readership, their gaming habits, and lifestye in addition to conducting research on the the gaming industry as a whole. In 2015, the video game industry pulled in 23.5 billion dollars in the U.S. alone. Every house has a gamer of some kind, whether they are the kind of player that spends few minutes a day playing Candy Crush on their phone or one who enjoys hours of getting lost in the immersive world of Skyrim. Most media outlets for gaming live as web based journalism like Kotaku and Vox, and as video content on Youtube. Most print gaming magazine have stopped publication, yet some remain. 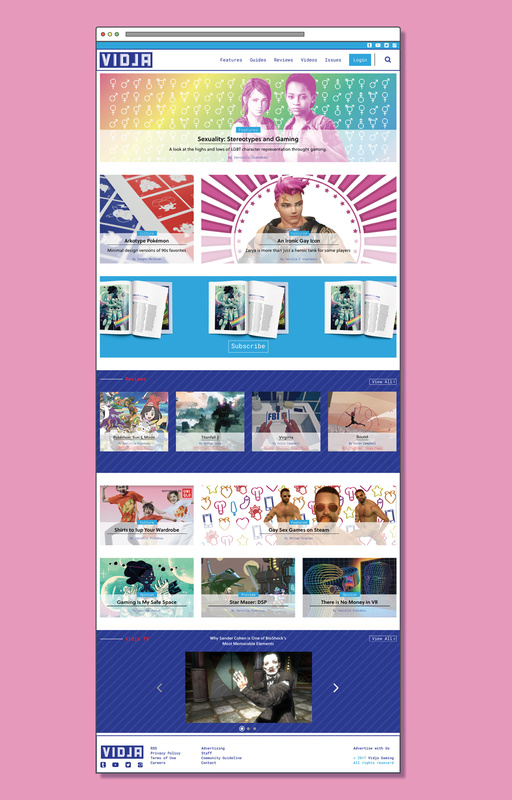 Gamers do by print material, especially for work that is visually driven or limited edition. I found that, while is not commonly known, the average age of gamers in the U.S. is 35 years old. Many of those who self identify as a “gamer” have been playing games since childhood, and the majority of them, roughly 70%, are over the age of 18. Videogames began to enter the household in the late 80s and early 90s, which has created the current generation of life long gamers who are reaching middle age and looking for their preffered mode of entertainment to grow up with them. While less likely to identify themselves as “gamers”, women make up 41% of game players which is starkly in contrast with public perception. VIDJA is bold, dynamic, and honest. 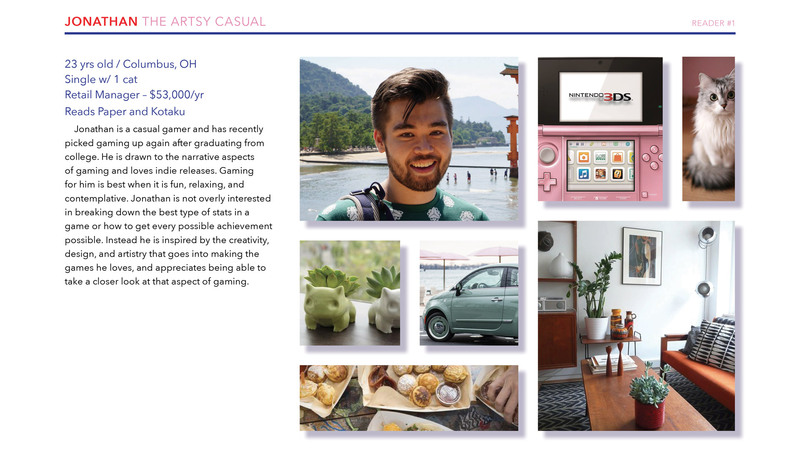 I sourced and wrote content that is playful and offbeat in tone like Lucky Peach, conversational and descriptive like Vox, and that dives deep into industry trends like Wired. As this magazine is geared mainly towards audiences aged 24 to 40, topics, subject matter, and language reflect this level of maturity. The visual tone of VIDJA is absurd, playful, and engaging. In order to draw in viewers who have no shortage of online gaming news, I created bold illustrations and visual directions that relate to gaming’s history and the theme of the month. Colors are used boldly and with great relish. Patterns are used throughout and often make direct visual reference to their digital nature. 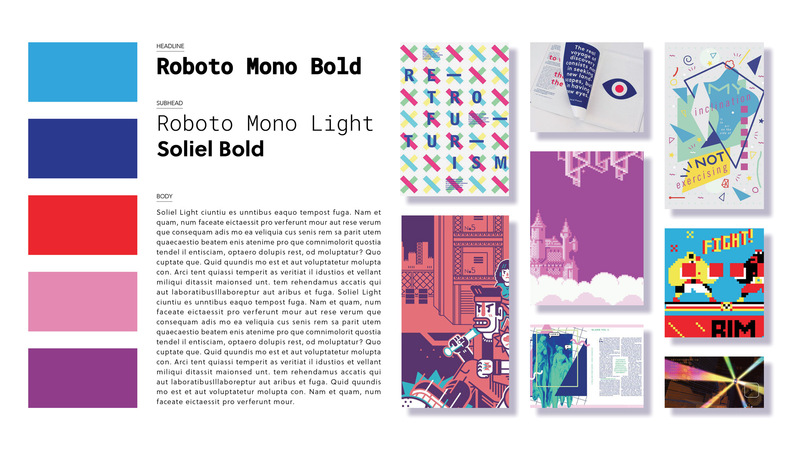 The primary typeface used in VIDJA are Soleil and Roboto Mono. Headlines and body copy are in Soleil for its open, friendly feel and long form readability. I chose Roboto Mono for subheads and accents to make light nod to gaming’s lower resolution past. Featured articles often utilize additional modified and dynamic type applications. Even with an engaging print presence, VIDJA still needs a web component as a touch point for readers. Using Sketch, I created a mock up for the VIDJA homepage. 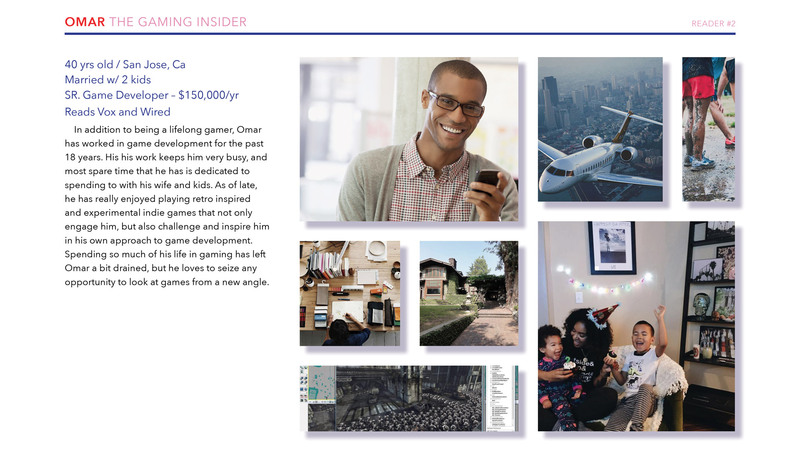 Utilizing an image heavy modular structure, readers can scan stories quickly like a feed and while relying less on a rigid category structure. I also incorporated video section, a large pull for the gaming industry, that would push quality content not found in the print magazine.